AIATSL Recruitment 2018: Air India Air Transport Services Limited Jobs – In recently released Air India Official Recruitment Notification PDF, candidates need to keep in mind that Age Limit and Education Qualification or may be many other things are different for AVSEC or Aviation Security Training Course qualified and non-AVSEC qualified candidates. First and the last phase of the selection procedure is an interview only as no written test will be organised. Besides, Rs. 500/- is the Application Form Fees for General and Other Backward Class candidates and Nill is the fees for Scheduled Tribe and Scheduled Caste candidates. For these 64 posts of Security Agents, no written examination rather walk-in will be conducted. By Walk-in station Goa, for Graduate with valid basic AVSEC, date and time of the interview is 29th September 2018 (Saturday) Time: 9 Am to 2 PM at the venue – Air India Limited Dempo House, Ground Floor, Campal, DB Marg, Panaji Goa 40301. While for all the job volunteer candidates who are Graduate without Basic AVSEC, on 30th September 2018 (Sunday) Time: 7 AM to 11 PM, at Don Bosco High School MG Road, Near Municipal Market, Panaji Goa 403001, the interview will be organised. In accordance with details available online on official website www.airindia.in, there is a total number of 64 vacancies of Security Agent for Walk-In-Interview for Air India Air Transport Services Limited. 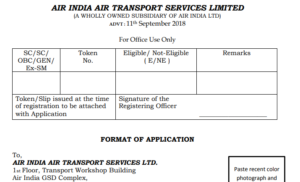 On 11th September 2018, AIATSL notification PDF is released on the official website and offline form filling procedure has also begun from the same day onwards. Walk-In Interview for this recruitment drive will be organised on 29th September and 30th September 2018. Air India’s US to Mumbai Bound Flights Has Got Unexpected And Unwanted Travelers, Bed Bugs!